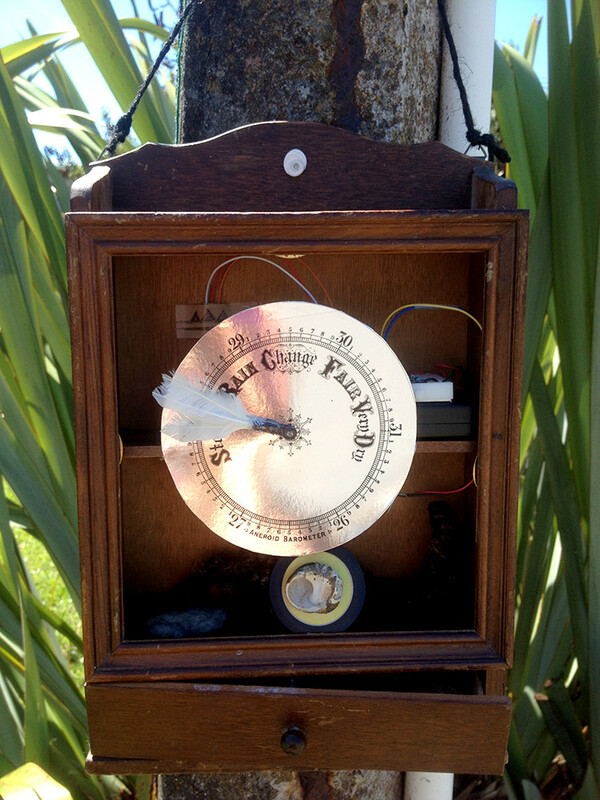 Pressure for Change, a barometric machine by Vicki Smith was a response to local, social and climatic pressure. The assemblage included a cabinet, collected natural objects and electronics. By blowing into a bubu shell, the right amount of breath resulted in the arm with the three raukura of Taranaki sweeping around the dial to indicate change. This work was requested to be placed into the Parihaka collection at Te Niho by Maata Wharehoka. Vicki is an observer, explorer and navigator siting one of her current works on an 11 metre sailing vessel – Kiritea. She has always been interested in how digital spaces can be site and tools, for exploring traditional technologies. Through her online activities, she is part of an arts and education community that is global. The relevance of solar power to sailing and the environment makes her involvement important. Vicki was an invited artist to Water, Peace, Power 2016.